If you’re ever in the Denver area, you must go see Red Rocks Park and Amphitheater, a 25-minute drive west on I-70. Perhaps you’ve seen broadcasts of concerts from this beautiful, natural, world-famous venue that sits at an elevation of 6,450 feet. Natural rock is used for auxiliary buildings, too. Even if you’re not familiar with Red Rock, you’ll be smitten by the magnificent rock formations that were created around 65 million years ago when uplifts changed the landscape from flat plains to rocky mounds of sandstone, siltstone, and shale. 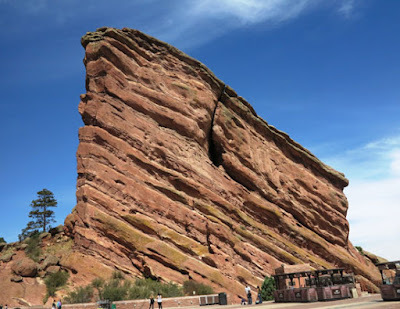 The three largest rocks—Creation Rock, Ship Rock, and Stage Rock (where dressing rooms for performers are located)—form an exquisite backdrop for the theater. The amphitheater is set in an exquisitely beautiful landscape. People arriving for the first concert in 1910 had to drive their Model T’s almost four hours and then sit on wooden platforms. But that didn’t deter them from coming to the Garden of the Titans, as it was called then. In 1928 the city purchased the land from John Walken, and construction by Denver parks took place between 1938 and 1941. Revered artifacts from the Ute Indians, who occupied the land during the 1800s, were discovered when CCC workers began building the park. hundreds of events every year. 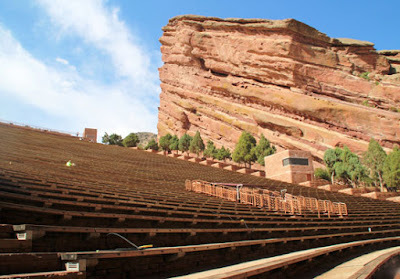 Opened in 1941, the modern Red Rock Amphitheater, which can seat almost 10,000 people, is recognized for its star-studded concert roster, naturally perfect acoustics, and ambience. 125 concerts were held there in 2015, and even more are expected as the park celebrates 75 years in 2016. The Visitor Center and Trading Post features interactive educational displays, a short film on its geologic and musical history, a Performer’s Hall of Fame, and the Ship Rock Grille. Special events like Easter Sunday services draw 12,000 people, and it’s a very popular site for weddings. In addition to musical performances, yoga classes are held on the rocks, and schools hold gym classes there. For anyone wanted exercise or a fitness challenge, to walk all the rows of seats in the amphitheater (in back and forth manner) is a 4.7 mile trek. 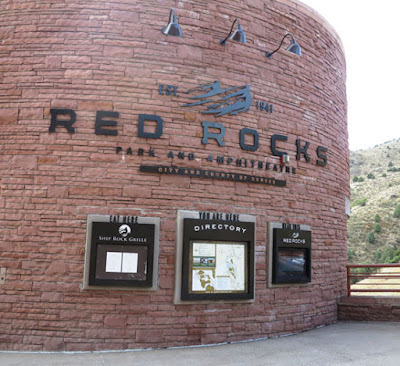 Red Rocks Park, which is open year-round, also offers an array of outdoor recreational opportunities amidst dramatic natural beauty. Biking and hiking trails are available, such as the Jefferson CountyOpen Space Red Rocks Trail. Picnic facilities are available, and a doable walking tour is highlighted on the park map. 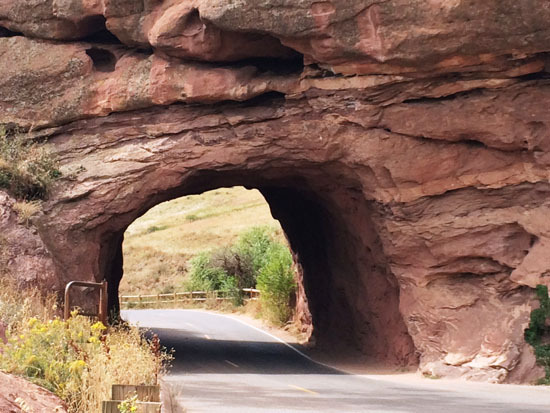 Even drive-through sightseers will enjoy the immense and brilliantly red rock formations. Daily tours are held at 10:00 a.m. June 1-October 1 or by appointment. $6 for adults; $3 for children.